Krisha Marcano (Florence Ballard), Allison Semmes (Diana Ross) & Trisha Jeffrey (Mary Wilson) in “Motown: The Musical.” Photo by Joan Marcus. 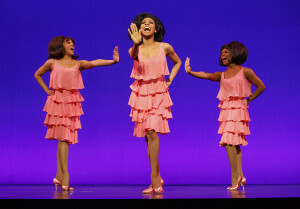 “Motown: The Musical” is perhaps the ultimate Jukebox musical. This show about music mogul Berry Gordy, from his early boxing ambitions to founding Hitsville, USA in Detroit and generating the music of a generation, has Motown’s mega-catalog at its disposal and uses it liberally with over 50 songs as performed by some of pop’s biggest stars. Actually, more like robust facsimiles of acts like the Temptations, the faithful Smokey Robinson (a most excellent Nicholas Ryan) and the Miracles, Mary Wells (Martina Sykes in the most impressive guest vocals of the evening), Marvin Gaye (Jarran Muse), and a fantastic Nathaniel Cullors, who in addition to playing a young Gordy and Stevie Wonder, absolutely nailed pre-teen Michael Jackson in his Jackson 5 routine in one of the most exciting scenes in the show. With bitingly-authentic choreography by Patricia Wilcox and Warren Adams, we witness impressive performances of gleeful hits such as “My Guy” and “My Girl” (both penned by Robinson), “Dancing in the Streets,” the protest era’s “The War” and “What’s Going On” and the resurgence of the label with “ABC” and “Brick House” in a revue that culminates at the Motown Reunion and 25th Anniversary concert in X1983. 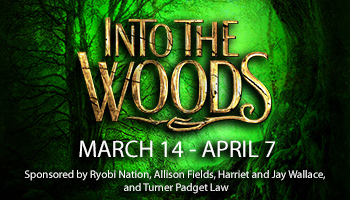 But this musical, written by Gordy himself, should be subtitled the Berry and Diana show, with about half the musical devoted his personal and professional relationship with the diva Diana Ross (a stupendous and physically-convincing Allison Semmes). As Gordy, the delightful Nik Walker delivers handsomely in his scenes, especially with Ms. Semmes, demonstrating Gordy’s obsession and control of the singer’s career, and running his empire. Semmes has the same silky Diana Ross voice and — as someone who saw the real Diana Ross on the very same Peace Center stage just a couple of years ago — looks exquisite with the no-hit Supremes (Krisha Marcano as Florence Ballard and Dana Marie Ingraham as Mary Wilson) in “I Hear A Symphony” and sounds like Ms. Ross, even taking her signature song (which is actually a waltz, who knew?) “Reach Out and Touch” into the audience for a couple of impromptu duets. The story does sheds light on Motown’s groundbreaking transition and acceptance at “white” radio stations and venues such as “The Ed Sullivan Show” and The Copacabana, and it delves into the day-to-day operations , supersized egos and the unrest within the organization, but most of the darker moments are just glossed over (Ballard’s alcoholism, Gordy’s shrewd business acumen, etc.). Similar to “Jersey Boys” structurally (and visually with moving LCD beams that frame the action making the story seemingly smaller sometimes), there are a few details not covered on the Hitsville, USA tour or in “Dreamgirls”, but this show is all about the music and on that front, “Motown: The Musical” is a tremendously entertaining success. “Motown The Musical” is directed by Charles Randolph-Wright and features scenic design by David Korins, gorgeous costume design by Esosa , innovative lighting design by Natasha Katz, sound design by Peter Hylenski, projection design by Daniel Brodie, and hair and wig design by Charles LaPointe. Motown The Musical is produced by Tony Award® winning producer Kevin McCollum (Rent, In the Motown The Musical continues through Sunday, Nov.29, with performances on Thursday at 7:30 p.m., Friday at 8 p.m., Saturday at 2 and 8 p.m. and Sunday at 1 and 6:30 p.m. Tickets start at $25 Call (864) 467-3000or visit www.peacecenter.org. The 10 Must-See Holiday Theatre Shows This Season!